Global Citizen kicked off its 5th festival season with a desire to increase the ways that activists can solve the world’s biggest challenges. Although the festival tickets were free, admission to the 60,000-person concert in Central Park was earned. My team and I designed an app to let people take action to influence world leaders and change legislation by calling, emailing, and creating visual petitions for issues like education for girls and women. As we took inventory of the available actions to take, we realized there was a perfect opportunity to design a mobile app to reduce the friction of our many phone-based prompts and meet our audience where they were already at. Our festival-going audience was predominately females in their late teens and early 20s, and our traffic skewed toward mobile. The complexity of thousand-person event in Central Park means deadlines and dates are determined far in advance and in this instance, much earlier than the existence of our team. We worked against the clock to plan how we could deliver the best experience in a short amount of time, which meant phasing our releases. Between September 2016 and February 2017, there were more than 110,000 app installs and more than 350,000 actions taken in the app alone. Even if you hadn’t gotten tickets, a second release included our livestream, which was also cast on our over-the-top devices, including Apple TV, Amazon Fire, and Roku. 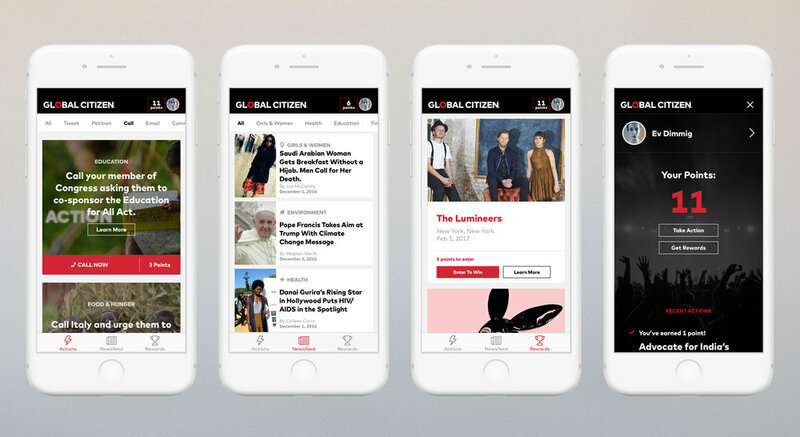 Although the festival is one of the more widely known rewards for engaging with these issues, Global Citizen partners with Ticketmaster to deliver hundreds of premium tickets to Global Citizens throughout the year. Our long-term goal was to generate a model to take action and see the incentives that would continue far after the single day event.